I’ve said it for a long time now, that protein is one of the key macronutrients when it comes to controlling your blood sugar. In fact, it’s not a bad idea for every meal to include it… even snacks. For breakfast every morning I have my regular breakfast of 4 whole eggs, greek yogurt and I load up my greek yogurt with blueberries while adding some tea (Green Tea is my fave). control than they did with lower to no protein meals. So if you too want to have better blood sugar control, I recommend adding protein to not just breakfast, but your other meals too. An important thing to keep it mind is, protein is essential to health… while carbohydrates are not. The study I mentioned above, also raised a good point that most American women don’t get more than 10-15 grams of protein for breakfast. And that protein number needs to be up closer to 39 grams for breakfast. At the very least, better blood sugar control is an order when adding protein. Not to mention weight control. Protein increases satiety and can make you feel satisfied for longer which can lead to weight loss. Very important for improving diabetes control. University of Missouri-Columbia. 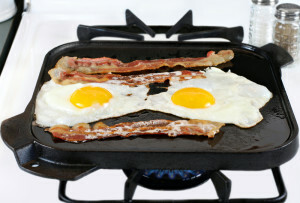 “Consuming high-protein breakfasts helps women maintain glucose control, study finds.” ScienceDaily. ScienceDaily, 29 April 2014.